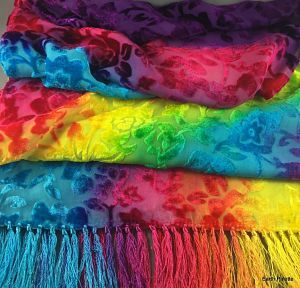 These beautiful scarves are Silk Velvet on a Rayon backing. They dye up wonderfully, but need to be dyed with Cotton Dyes as the Rayon backing will not dye with either the Silk or Wool Dyes. So they need to be soaked for a short time in a Soda Ash solution before dyeing with Cotton Dyes. Wash in hot soapy water before dyeing.